The Cornucopia Business Association invites you to move or start your business in the beautiful “Up North” where life is busy during the summer months and more relaxed the rest of the year. Cornucopia is the perfect location for a “second” career or a fabulous place for you raise to your family. Have you ever wondered what it would be like to wake up every morning in the very place that others dream of? Why not consider looking into the possibilities of making your home in the Cornucopia, Wisconsin area? HIGH SPEED FIBER OPTIC cable came to Northern Bayfield County in 2013 with speeds up to 100 megs. Many companies are now outsourcing work to home based employees. Want more information? Bring Your Business to Northern Wisconsin! 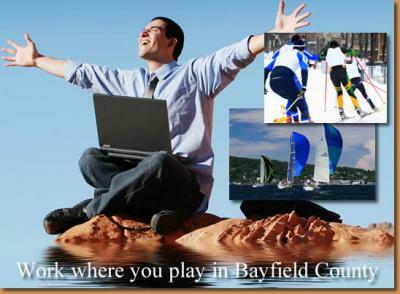 Check out the Bayfield County Economic Development Corporation website. There are a few business opportunities available in the area, some with excellent locations. Check us out next time you vacation in the great Northland. Stop in and say “Hi” to any of our CBA member businesses. They'll be happy to show you around and give you some samples of the South Shore hospitality. The area’s top producer! Over 35 years experience providing professional and personable real estate services including Buyer Agency! Our mission is to be the best realty company on the Bayfield Peninsula by providing expert and ethical real estate services in a highly responsive way, sensitive to the communities we serve and our beautiful natural environment; using our extensive and diverse experience to achieve positive results for our clients and customers and financial success for our company. Custom-Tailored Property Management & Vacation Concierge Services for Lake Superior’s South Shore – We offer full service property management, vacation rental management, and vacation concierge services for home owners and vacation home renters. Full-service marketing, design, and go-to-market strategy advisory firm. We specialize in start up companies and independently-owned businesses. We make “big name” marketing & design firm services affordable to small businesses. Offering comprehensive marketing services, from overall strategy to targeted marketing campaigns encompassing print, web, social media, and more. Design services include: web design & development, logo/brand identity, print materials, packaging design, and custom graphics for pretty much any application you can imagine. We operate on a sliding fee scale based on your business’ growth stage and size. Friendly, Dependable real estate service for Bayfield County, Ashland, and surrounding areas. Country Care Pet Hospital Veterinary Emergency & Specialty Care full-service animal hospital serving Bayfield County, Wisconsin Country Care Pet Hospital provides surgical and general health care for your special pet. We are worth the stop! Come Explore Cornucopia. Good Earth Outfitters LLC provides cost effective power boat tours to the famous Lake Superior Apostle Islands Mainland Sea Caves, Sand Island and Raspberry Island Sightseeing Tours, Devils Island Private Sunset Tours and Water Taxi Services in and around the Apostle Islands. We also have a well-stocked gift shop with Lake Superior Jewelry from local artists and quality products from Minnetonka Moccasin, Sailor Bags, Lakegirl, Landstrom’s and More Polish Pottery to name a few. Cornucopia is the Western Gateway to the Apostle Islands. We are located in the Marina District next to the Green Museum. For your convenience please go to our website and book your adventure online today! BOOK YOUR ADVENTURE NOW! Family-Style Restaurant and Tavern, serving locals and tourists with a welcoming atmosphere. Every Friday and Saturday Night from 4-8pm we will be offering an All-You-Can-Eat Salad Bar! DOWNLOAD OUR MENU We are located on Mainstreet across from the Historic Ehlers Store. We offer delicious home-cooked meals and a great selection of bottled beer, liquor, and other spirits. We also have a fantastic game room fit for all ages! Family Friendly, open Wednesday through Sunday January through November. Spirit Creek Farm makes small batch fermented vegetable products in Cornucopia, WI from organic vegetables grown in Minnesota and Wisconsin. Our products are a cornucopia of live cultured vegetables bubbling with probiotics and lactobacilli to support digestion, health and offer superior flavor. We make: Kim Chi (Korean inspired), Purple & Green Sauerkraut, Ginger Carrots, Curtido (Central American inspired), Beets, Garlic Dill Beans and Pickles. In Cornucopia buy our products at Ehlers General Store and Star North Gas Station.